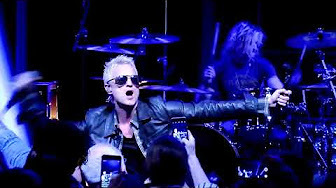 The Stone Temple Pilots, The Cult and Bush performed at NeueHouse in Hollywood, CA on April 3 to highlight the announcement of their Revolution 3 North American tour this summer, and video of the full event is streaming online. Set to begin in Nashville, TN on July 18, the 20-city run will see the three acts perform full sets while taking the stage in a different order on every stop of the revolving headline run. Stone Temple Pilots recently issued their 2018 self-titled album with Gutt; the set has reached No. 24 on the US Billboard 200 in the first few weeks since its release. The band are currently playing a series of spring US dates ahead of the summer shows with The Cult and Bush.